"...estimated it could cost an additional $350,000 to bring SAD salaries to Hermon's rate. ...Several scenarios resulting in the same choices: kick in more locally or cut the budget. "...Mr. Pelletier posed the question -- Is it still cheaper to pay penalty this year and move on? ...RPC voted to authorize submission knowing the superintendents will submit a budget to be included. ...added that a softer version of the AOS may be better suited for Hermon/Carmel/Levant." ..."For $18,000, we give it away? I don’t think so." "...an imperfect product with many unknowns the state could still change." ...don't think that Winthrop will save a dime. ...SAD 4 directors, the district’s partners in the plan, voted a unanimous no on Tuesday. ...Members discussed whether filing the plan for the AOS would preclude WOCSD from seeking stand-alone status. They ultimately decided it would not. ...selectmen and school committee members are against the state’s reorganization mandate “because it is not supported by clear reasoning and accurate data,” they say. ...The school district could choose a new name, Cormier said. ..."It isn't about us versus them," said Courtney, the Assistant Senate Minority Leader. "It's my hope that when all is said and done, both communities have this." ...suggests that the U.S. Census policy that calls for the inclusion of prisoners in the count for the localities where they are incarcerated, rather than the communities where they vote and maintain homes, is harmful to democracy. ...Cape board took issue with the formula the state used, rewarding higher property valuations with higher cuts. 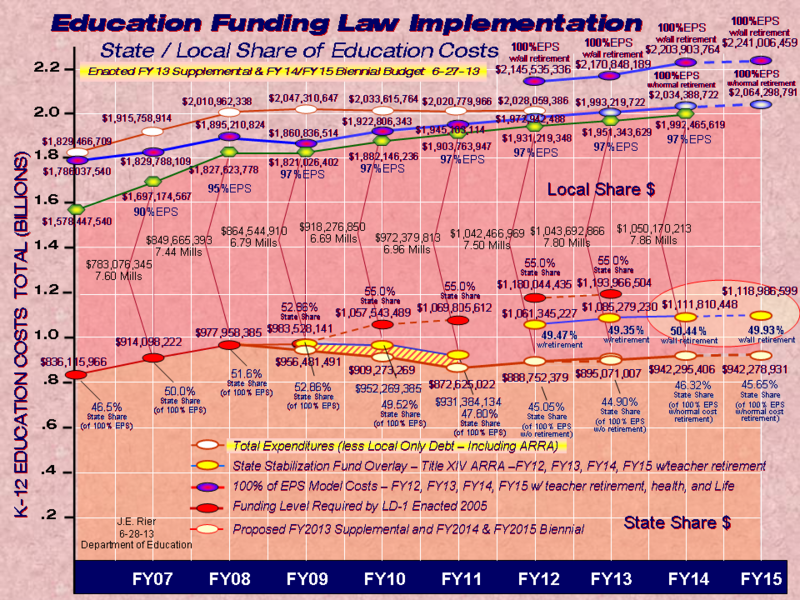 ...Ultimately, the state likely will accomplish a resulting reduction in the amount of money it must allocate for K-12 public education in Maine. But for many communities, their education costs will go up, not down, in the form of higher property taxes. Local town meeting votes on school budgets no longer will occur, and local school boards making decisions about the needs of their students and communities will have become a thing of the past. ...“My big beef with the Department of Education and the commissioner is this: you cannot penalize Kittery for not forming an RSU with a neighboring district when your department authorized our neighboring districts alternative plans that did not include Kittery. You can’t do it,” Pelletier said. ...Falmouth will avoid a $473,000 penalty that loomed after voters last November rejected consolidation with School Administrative District 51 by a nearly 3-1 margin. ...committee members voted unanimously to further investigate establishing an AOS, which Freve acknowledged could be “a burden” for towns to administer. ...Johnson said he is not sure why the Department of Education did not approve the first alternative plan. ...Maine's network of school districts has become unwieldy, Connerty-Marin said, and the percentage of school spending devoted to administrative expenses has risen in recent years. ...And Gray, the teachers' union director, called for higher pay for teachers, saying Maine is a "net exporter" of teachers. "I am concerned that an unintended consequence of consolidation will be that many Maine schools will no longer qualify for these grants," Collins said Monday. ...concedes that the savings of the proposal aren't great. School officials have calculated an additional cost of $50,000 the first year, then $125,000 in savings the next couple years. He says that state officials have overblown the possible savings. ...this may be of less of a magnificent gesture than intended. The only districts eligible were those with fewer than 600 students. 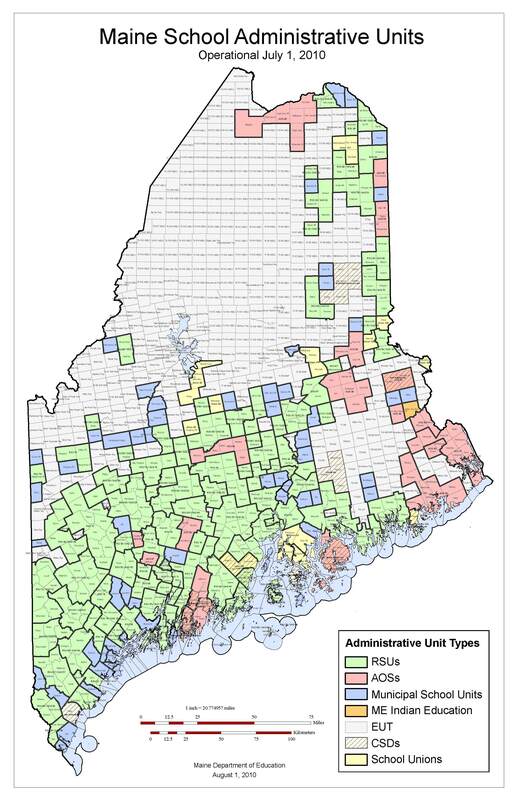 Under Maine's consolidation law, districts now have to be twice this size. LD 95: An Act To Eliminate Penalties for Nonconforming School Administrative Units, Rep. Edgecomb, Rep. Johnson, Rep Clark. "...saying that the local electorate who vote on the budgets each year and the local school boards are not doing their jobs and he can do it better for them. ...It's nothing but a power play."